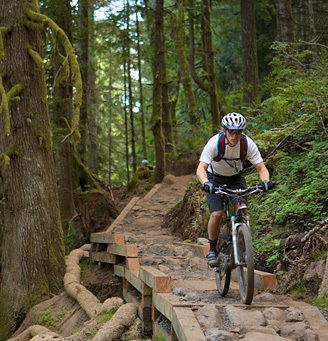 As a dirt lover, I’ve been hankering to check out the Sandy Ridge Trail, which holds a special place as the mountain biking single-track closest to Portland. Located just east of the town of Sandy on the southwest flank of Mt. Hood, the system’s loops make up about 12 miles of riding. One recent spring day, I packed my wheels and headed out for a late afternoon spin in the woods with anticipation. I got to the trailhead just in time for the sideways rain. I sat in my car, watching the deluge and considered my options: Go home, wait it out, or rally. After all, that’s what Gortex is for, right? Luckily, this was a typical Oregon spring rain, which means it was a squall, not a storm. The drops fell just long enough to wash the forest clean. The one-way trail system starts with a 4-mile ascent up a paved road that is closed to traffic. As I climbed, steam rose from the warming pavement, and sunlight drenched the green forest, electric with new growth. Purple foxglove, white Shasta daisies and wild iris lined the road, glinting with the recent rain and swaying in the slight breeze. Trail details: All trails are one-way. Check the trailhead map to make sure you are headed in the right direction (or download a PDF from the Oregon Bureau of Land Management website). The system includes black, blue and green sections. Two new trails, Follow the Leader and Flow Motion, were just opened in July 2013. Local wheels: Need a bike? Sandy Bicycle can rent you one. They’ll rent you a bike rack, too (and even put it on the car for you.) You can also pick up wheels at Otto’s Ski & Bike Shop. Get there: From the east side of Sandy, head east on US Highway 26 for 11.4 miles. Turn left on Sleepy Hollow Drive soon after a large sign indicating a left turn for Marmot. (This will be the second turn-off for Sleepy Hollow Road.) Go 0.3 miles on Sleepy Hollow Road, turn right on East Barlow Trail Road and pass over the Sandy River. After 1 mile on East Barlow Trail Road, look for the trailhead and parking lot. Trails intersect with the paved Homestead Road, located just beyond the parking lot.